Combine equal parts bold style and playful details, add a spoonful of sass, mix well, and what do you get? An expertly curated Trunk by fashion trailblazer and tastemaker, Courtney Kerr. 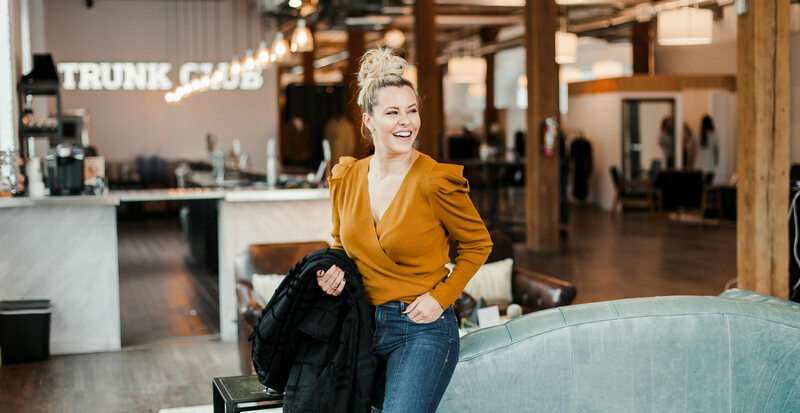 As an influencer who documents her fearless style adventures on her blog, KERRently, she makes getting dressed an absolute blast. That’s why we asked Courtney to serve up some major style inspiration for us with three looks that don’t hold back. Scroll on to see what she's included in her KERRently curated Trunk. If there were ever an outfit to showcase Courtney’s head-to-toe fierceness, this would be it. A sweater with sculptural pleated shoulders is a guaranteed conversation starter all on its own. Paired with a pointy-toe bootie in a contrasting animal print design, you have a look that wows. Though seemingly dramatic because of the details, this outfit is balanced and very wearable thanks to the deep shades of honey tying everything together. Not one to go for the basics, even the LBD Courtney chose is gorgeously embellished. The gold buttons on this comfy sweater dress create a tailored, slimming effect. She tops the look with a notched-lapel velvet blazer in a stunning emerald hue that is perfect for any holiday soirée. And because you can never go wrong with a fabulous shoe, she completes the outfit with heeled booties cuffed with plush faux fur. We love anything menswear-inspired, which is why we were elated when Courtney chose this tuxedo-style blazer. Soft satin details feel feminine, while the dual-toned design brings a sense of versatility. Leather skinny pants are a step up from regular black denim, and are just as wearable. Her shoe is like a modern glass slipper, accented with colorful animal prints on the toes and heels.